This diorama perfectly captures the feel of the sneaky Clan Eshin. 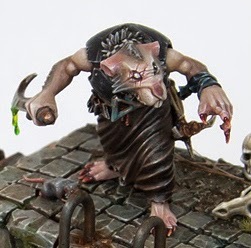 The Gutter Runners models are some of the most dated in the Skaven range, so it's always nice to see someone do a more updated version of them. The re imagining of the Skaven range back during the 7th edition release are some of my favorite models and these guys fit right in. I really like the fact that he made it a pair of Skaven as opposed to the easier solo model. They just aren't a race that likes to travel alone. The conversion work on the models is subtle and fits right in with the existing GW range. That is the best type of conversion in my opinion, something where you really need to look hard to find what's different. The weapons are from the new Spirit Host models since they have an Asian feel to them, and are in fact what inspired him to make this whole diorama in the first place. The display base is almost a third model in its own right. I can really picture this being a part of the sewers in the Empire. It has just the right amount of detritus that it doesn't overpower those fantastic cobblestones. The painting is top notch as well. It's very similar to the 'Eavy Metal style, but takes it a step further with grittiness. It reminds me of the models you see from an 'Eavy Metal painter's personal collection. It's just as clean and smooth, but has a little more freedom since it's not for advertising purposes. 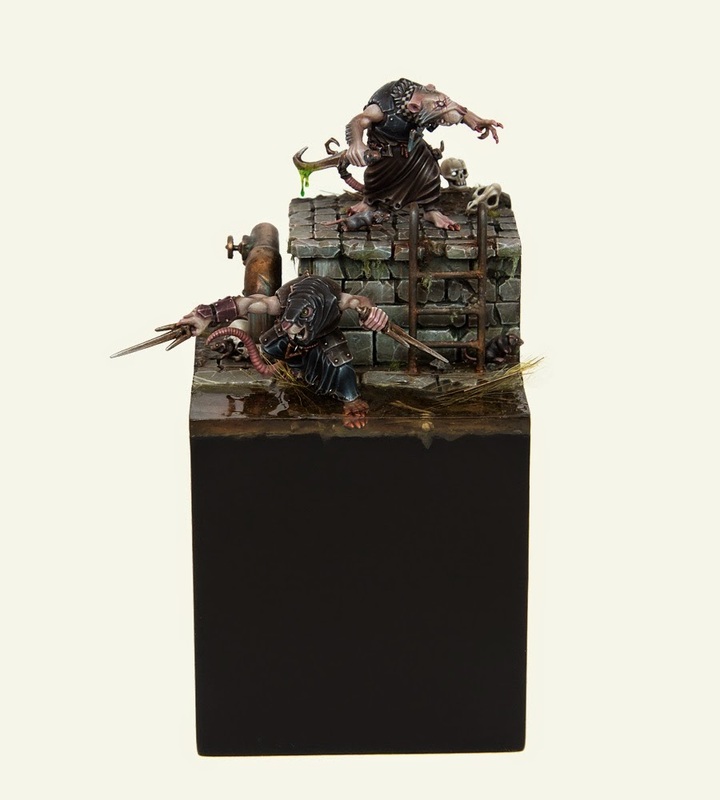 I have always liked the Skaven and have a few of the Island of Blood models laying around, this diorama may just inspire me to start on them sooner rather then later. Be sure to check out more views of it on the Stockholm Warpaint site. They have a really in depth look at how it was painted and built too.